Lucca wins the blues at the Big E 2011! 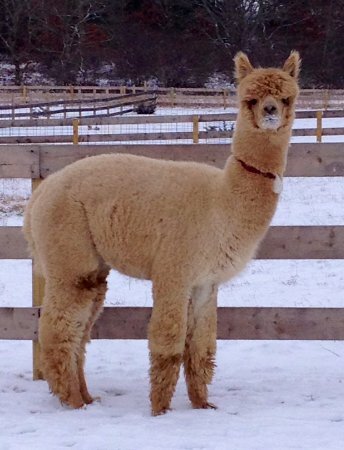 Lucca is an incredible male who has very fine and tight crimped fleece. The fleece is very uniform and he has an amazing stature! He's phenotype is spot on with a wonderful conformation, a perfect bite, a strong frame, and a very pleasing look. He has nice long legs and a great top knot similar to the genetic trait clearly present also in his brother Khan D'Or. Lucca's sire is CT Estrada who has to his credit eight multiple champions and over 30 blues. His dam is Golden Frida and her sire, the well noted Snowmass Legacy Gold! Lucca's first cria arrived in 2015, Luciana, a fawn female who has absolutely gorgeous, bright, fine fleece. She looks identical to her sire and we are very happy with the results! Her confirmation is amazing with perfect straight legs, thick-boned frame, and a gorgeous head....we can't wait to show her! Take advantage of his low introductory rate. 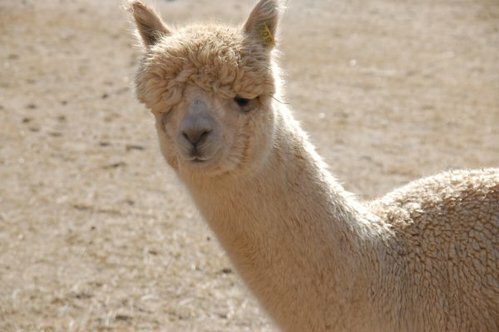 2016 Big E Alpaca Fleece Show judge Arturo Pena commented: "Good uniformity of micron and length. Nice brightness." 2015 MAPACA Jubilee fleece judge Cheryl Ghely commented, "Wonderfully fine throughout!!" Fleece Highlights: Fineness/Handle, 19 out of 20. Micron, 7 out of 8. Length, 6.5 out of 7. Color, 4.5 out of 5. Brightness, 8 out of 10 possible points. 2014 Green Mountain Alpaca Fall Spectacular Show - Judge Ursula Munro commented: "Showing excellent fineness and soft hand; great uniformity of micron and character throughout." Fleece Score Highlights: Fineness/Handle, 18.5 out of 20. Length 6 out of 7. Color, 4 out of 5. Brightness, 8 out of 10 possible points. 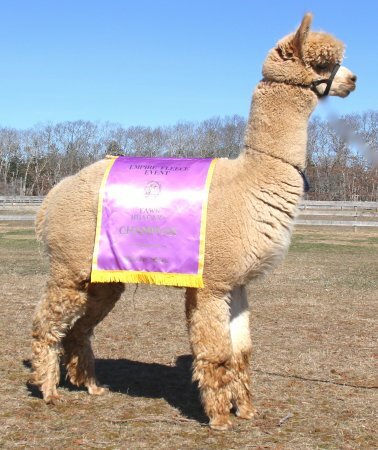 2014 Empire Alpaca Extravaganza Show - Judge Cheryl Gehly commented: "Love the fineness and brightness for age!" Fleece Score Highlights: Fineness/Handle, 19 out of 20. Length 6 out of 7. Color, 4 out of 5. Brightness, 8 out of 10 possible points. 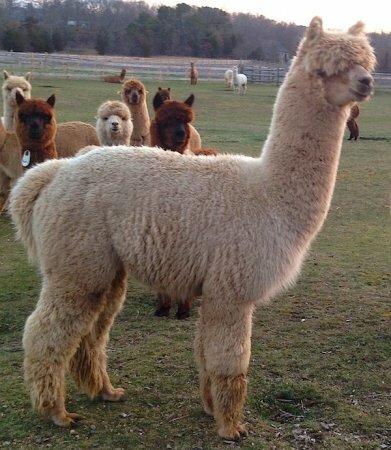 2014 New England Hands on Alpaca Fleece Off Show: "Shows excellent fineness and character; great uniformity throughout this bright, soft fleece." Fleece Score Highlights: Fineness/Handle, 18.5 out of 20. Micron, 7 out of 8. Color, 4.5 out of 5 possible points! 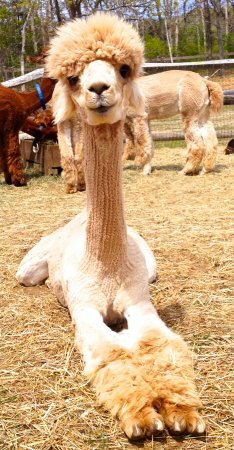 2013 Empire Alpaca Extravaganza Fleece Show: Judge Ursula Munro commented, "Wow - Uniformity in this fleece is impressive! Fine and soft." Fleece Score Highlights: Fineness/Handle, 19 out of 20 possible points! 2013 Tennessee Waltz Fleece Show,"Holding good fineness and handle with good brightness." Fleece Score Highlights: Fineness/Handle, 18.5 out of 20 possible points! 2013 North American Alpaca Show: Judge Jude Anderson commented: "Nicely grown and well balanced in his frame and his proportions. Fleece was nicely uniform. Very fine and soft!" 2013: Wade Gease commented, "Holding good crimp style with age." 2013 Green Mountain Fall Spectacular Fleece Show: Judge Cheryl Gehly commented: "Simply extraordinary fleece! So fine and uniform - dense, highly aligned, bright fleece!" Fleece Score Highlights: Fineness/Handle, 20 out of 20 possible points! Total fleece score was 80 out of 100 possible points! 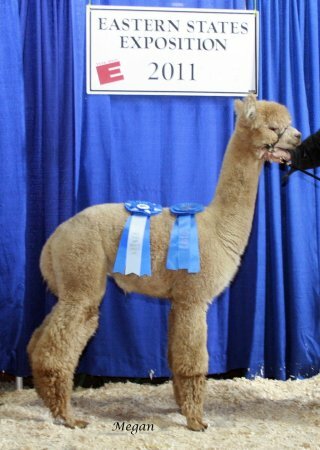 2012 North American Alpaca Show: Judge Amanda VandenBosch commented: "Most complete overall. Very clean and nicely grown out. Good proportion. Very fine fleece. Fleece organizes extremely well within the staple. Great uniformity from his legs, into the belly and up into his neck. Incredibly handling soft fine fleece." 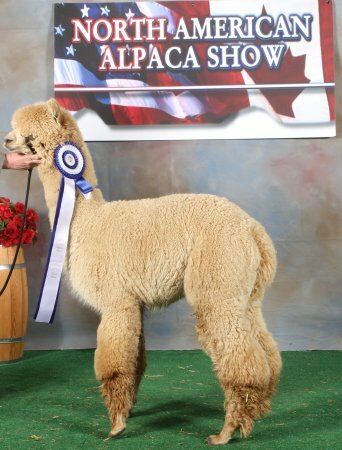 2012 North American Alpaca Show: Judge Jude Anderson, commented: "Strong frame. Fleece is very, very soft. Really bright. Great softness of the hand and brightness." 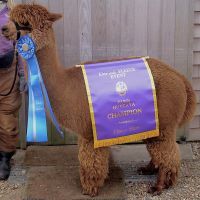 2011 The Big E Alpaca Show: First Place - "Bred and Owned"
Estrada is a well-balanced male from two top parents. His Sire, Evander, does it again with this amazingly dense, fine fleece male with a great handle and luster, extensive coverage and a great body. With his 2012 shearing, Estrada had over 12.6 pounds of fleece sheared off. Amazing! !